I usually talk about how I can't believe that certain toys have not evolved or upgraded their options since I was a kid, however once in a while comes a toy so great and so lovely that I'm super grateful the exact same versions still exist for my little one. This is the case with Corolle dolls. Way long before American Dolls became a fad and made their way into my little-girl bedroom, I grew up on Corolle's. 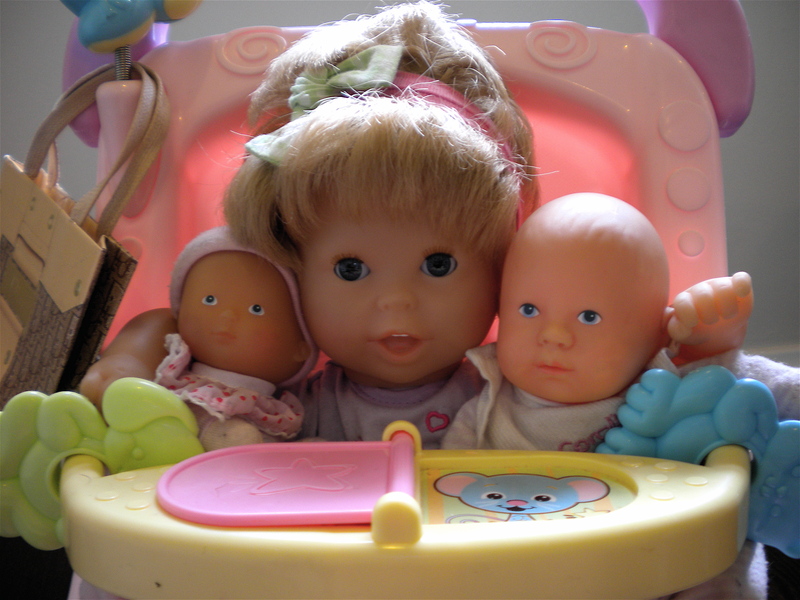 This fabulous French doll company has been making award-winning baby dolls since 1979. The dolls are now sold in more than 29 countries across the world, and in my opinion are better than anything else out there. Never mind the superior quality and look of the dolls, I just love how many options there are! Corolle makes dolls in a myriad of sizes and forms; you can buy bald ones or babies with hair, dolls for infants, toddlers, and little ladies, and if you're searching for a soft-bodied doll that can go in the bath tub, they make those too! Freida got her first Corolle from her Bubby when she was 4 months old - a soft rattle doll with a "lovie" blanket attached to its hand. We bought her a second at around 8 months old - a version a tad bigger, bean-filled body, and bald. Her third was sent from her Great Grandma in Chicago (who spent hours with me when I was a kid in FAO Schwartz picking out the most beautiful ones!) - perfectly short hair, visible teeth, and realistically well-shaped hands and feet. My absolute favorite thing about these dolls is the fact that the "new-doll-scent" last forever, because they bake the doll "skin" with fresh vanilla beans!! Wait 'til you take a whiff - lovely! And believe it or not, they are priced well, to boot! If you don't know of a toy boutique near you that carries them, you can buy one here.